Back in 2007, Radiolab did an entire episode on the topic of emergence. Emergence is the idea that structure can arise from complex systems not because of a leader directing the show but simply due to the combined behavior of all of the individual components of that system. Common examples are flocks of birds and schools of fish that move together, seemingly as one object. 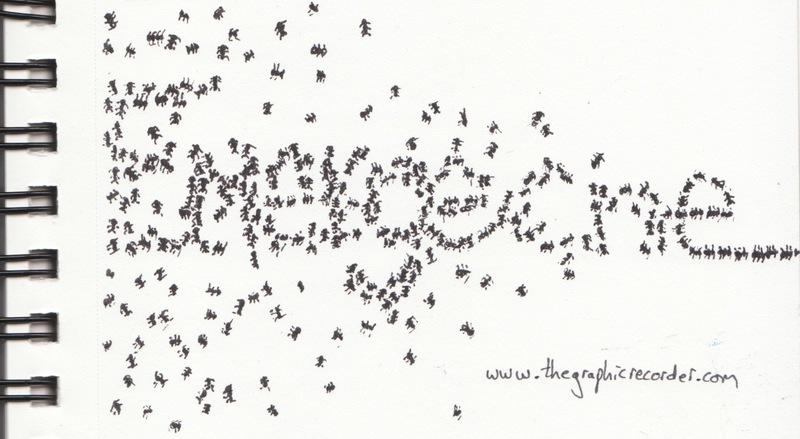 Another often used example is a community of ants (which are discussed in the Radiolab episode), which also move together in coordinated ways. The idea that I am trying to get across in this sketch is that the actions of individual members of the group can combine in productive ways, without the need of a leader. As you scan the picture from left to right, you are actually moving forward in time. When ants are foraging for food, they randomly search the surrounding area, but once a food source is located, the ant that found it retraces its steps while carrying some of the food home. Since ants leave a trail of pheromones as they walk, this will strengthen the pheromone path to the food source and eventually a second ant will reach the food source, pick up some food, and then trek back home, which strengthens that particular path even more. As this pattern continues, it doesn’t take long for a continuous train of ants to be moving to and from the food source in a narrow line – just like in the last letter in the word in the sketch. I hope to keep doing sketches like these that focus on one specific word. I think that it is a great way to commit that word to memory and also explore it in ways that a dictionary definition alone doesn’t inspire.